This study aimed to assess the spatial and seasonal distribution and anthropogenic sources of trace elements (Li, Be, Al, V, Cr, Co, Ni, Cu, Zn, Se, Mo, Ag, Cd, Sb, Ba, Tl, Pb, and U) by ICP-MS in the Ave River lower basin, Portugal. Mean values (µg L−1) of Al (2384), Zn (55.3), Se (34.6), Cu (24.7), Pb (12.7), Ag (0.75), and Cd (0.66), exceeded the water quality guidelines for the protection of aquatic life. The decreasing order of trace elements concentrations in surface water and sediments was, respectively: Al > Zn > Se > Mo > Li > Ba > V > Cu > Pb > Ni > Cr > U > Be > Co ≈ Sb > Ag ≈ Cd > Tl; and Al > Zn > Li > Ba > Cu > Pb > Cr > V > Ni > Co > U > Be > Se ≈ Mo ≈ Tl ≈ Cd ≈ Sb ≈ Ag. Moreover, the concentrations of nitrate values were higher than 50 mg L−1. To distinguish natural from anthropogenic sources, the geo-accumulation index (Igeo) and the enrichment factor (EF) of sediments were determined. 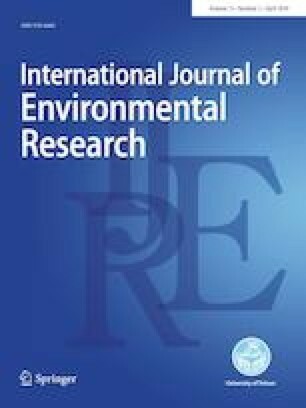 Igeo revealed high contamination by Al, Mn, Ba and Zn, while EF evidenced enrichment for Se, Cd, Zn, Li, Cu, Ag, Pb and U. Bioaccumulation factors (BF) in flora suggested that macroalgae, Medicago marina L. and Plantago lanceolata L., might be accumulators of Se, Mo, Ba and Pb (BF > 1). The highest translocation factor (TF) was found for Mo in leaves (33.6) and flowers (28.1) of P. lanceolata L.. The online version of this article ( https://doi.org/10.1007/s41742-019-00174-z) contains supplementary material, which is available to authorized users. This work received financial support from the European Union (FEDER funds POCI/01/0145/FEDER/007265) and National Funds (FCT/MEC, Fundação para a Ciência e Tecnologia and Ministério da Educação e Ciência) under the Partnership Agreement PT2020 UID/QUI/50006/2013 and the Project PTDC/SAU-ESA/108871/2008. This work was also supported by CESPU, through Project MYCO-CESPU-2016, ChiralDrugs_CESPU_2017 and BIOENVIROM-CESPU-2018.